The New York Times pulled down its paywall Tuesday to provide unlimited access to the site and coverage of the midterm elections to the public. The Times also took down its paywall in November 2016 for the presidential election results, but not for the midterms prior. The Upshot -- the Times’ data-driven platform focused on politics and policy analysis -- is providing live forecasts of House and Senate elections. The platform is forecasting who will win which states, with features like the infamous “election needle” and interactive maps, based on turnout patterns, exit polling and demographics of places where votes have already been counted. The Washington Post did not take down its paywall Tuesday, but is offering a 50% discount to its digital subscriptions ($50-$75 for an annual subscription) to make its coverage more accessible. 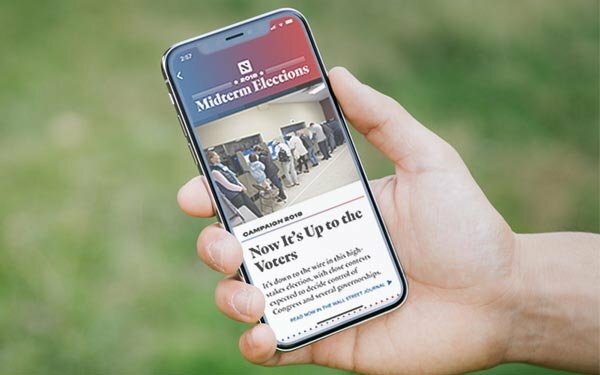 The Apple News app will change its Midterm Elections section Tuesday night, replacing it with a new Election Night section. It will also replace the Apple News Digest tab in the app. These changes are intended to lead users to live results and updates on key races in the app, according to TechCrunch. Apple partnered with the Associated Press for its election coverage, infographics and a list of election results in every state updated in real-time. CBS News, CNN and Fox News will also contribute video clips to the Election Night hub, according to TechCrunch. ABC is providing a live video feed, as is NBC News, though that feed will appear next to the Live Results infographic in the Apple News app. Apple has an editorial team of former journalists to curate its Apple News platform, unlike Google, Twitter and Facebook, which rely primarily on algorithms and other technology for aggregation.